When I picked up this book I had no idea that I wasn’t going to move until I had devoured the whole thing but that is exactly what happened. This book was such a refreshing read and I loved that as well as tugging on my heart strings I was able to openly laugh along. Mia is the middle sister of the Campbell-Richardson family. Big sister Grace is an academically high achiever who has secured herself a place in one of the UK’s most prestigious universities. Little sister Audrey is a competitive swimmer who is rumoured to have Olympic glory in her future. Mia is the middle sister who thinks she has nothing going for her. She hasn’t found her ‘thing’ yet and feels she is living in the shadow of her sisters. When Grace returns to the family home with an unexpected surprise, Mia’s expectations do not become a reality and she takes a turn down a path of self-destruction. When I think about this book, I can only think about how much adored it. Lisa Williamson has a brilliant writing style that completely captures everything I love in a YA book. Her characters are so real and I could empathise with each one at some point in the book. Her characters are also flawed in their own ways and this is something I always love to read, especially in YA where such valuable life lessons can be learnt from fiction. I think this will be a book that a lot of young readers will connect with easily. I love the way this teaches the reader that if you haven’t found your ‘thing’ yet, that’s okay. You are still loved and appreciated and your time will come. Grace’s predicament was fairly predictable but I loved what then came out of it. Mia certainly starts down a whole path of self-destructive behaviour with drinking, sexual encounters, falling out with friends, persistent lying and that’s just the beginning. I loved her character development throughout this book and was so glad to follow her full circle. Without spoiling anything, the last couple of chapters of this book brought nothing but love and warmth to my heart and I truly felt like I had been on the experience with her. There is a particularly special scene between Mia and her mother at the end of this book that completely reduced me to tears. At times during this book I just felt endless sadness and tinges of anger. As someone who works with teenagers on a daily basis, Mia’s behaviours really reminded me of some of those really vulnerable teenage girls I work with who follow a very similar path to Mia. The way Mia craves attention for her sexiness was something that I didn’t particularly like but I unfortunately know it to be true of so many young girls these days. There is no doubt in my mind that Lisa Williamson has an excellent understanding of teenage girls and their feelings of self-doubt. I LOVED Mia so much. Don’t get me wrong, at times she is exceptionally whiny and says some extremely bitchy things but I can understand why. We have all had those moments where we feel that we are invisible to those around us, whether that be family or friends. It is the worst feeling and more often than not brings out the worst in us. This is why I cannot possibly dislike Mia, I just get her. I loved her sense of humour and how her sarcasm just shone through – how very British! Mia doesn’t always get things right, she makes a whole series of questionable choices in this book but by the end she has discovered her true self and finds someone that she is happy to be. Mia is such a huggable character and she will stick with me for a long time. I actually really liked all of the characters in this book by the end! I was a little wary of Sam for a while as my crazy imagination suspected him of ulterior motives straight away. I really adored Audrey who just seemed like the sweetest little thing and I also liked Grace, despite seeing her through Mia’s eyes. The family dynamics in this book are marvellously written and I have to thank Lisa Williamson for that. This book focuses heavily on the relationship between the three sisters and I loved every second. There were so many moments that touched my heart whether it be the Audrey asking her big sister Mia for advice about periods or the heart to heart that Grace and Mia have, I just felt that these relationships were so true to real life sibling relationships. 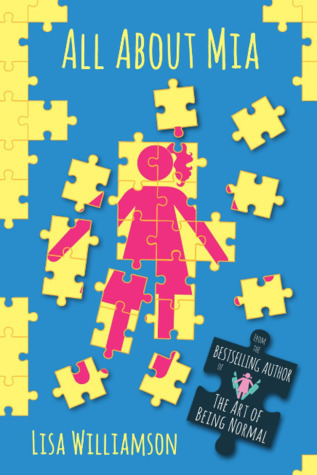 It was refreshing to read a book where sibling relationships aren’t perfect but worked towards all three sisters developing a better understanding of how the others feel. It was wonderfully written. Heart-warming and emotional with plenty of laugh out loud moments, All About Mia is a book that is bound to touch the hearts of many. Have you read All About Mia? What did you think? I can’t wait to get to this one! Eeek! I’ve only heard about All About Mia from your blog, Kelly. And based on this review, I’m both surprised and saddened by that! It sounds like this is a beautiful and realistic portrayal of teenage life. Complicated life, but still. Character development is always the best part of reading for me. It sounds like this book is just up my alley. Lovely review, as always! Please keep them coming. Thank you Jackie, that is such a lovely comment! All About Mia has been talked about a fair amount in the UK. It’s a wonderful book! Aw thank you so much! I definitely got a bit carried away but I think that shows exactly how I feel about the book. It’s wonderful and I really hope you’ll enjoy it too! Ahhhhhh, I loved this book so much too! Lisa is such a good writer! I felt the same about Sam btw and I’m very glad it didn’t go where I was expecting it to. Yay I’m so glad! I love Lisa’s writing style! Her characters are SO realistic and well written! Glad you also felt the same about Sam, I don’t think I’ve ever felt more relieved that my predictions didn’t come true lol! I was so worried that I’d be disappointed after the genius that was The Art of Being Normal, and I’m so glad I wasn’t. I can’t wait for whatever’s next for Lisa!